My husband gives our 2-month-old a bottle of breastmilk when I’m at work. Our 4-year-old also gets a share of mama’s milk. Every time a baby goes to breast, the $70 billion baby food industry loses a sale. The U.S. Delegation to the United Nations-affiliated World Health Assembly (WHA) undermined a global resolution aimed at supporting breastfeeding, threatening trade sanctions against Ecuador before yielding to a proposal put forth by Russia, reported by the New York Times. The draft resolution was to reaffirm that breastfeeding is critical for child development and maternal health, to express concern over low rates of breastfeeding worldwide, and to call on WHO Member States to increase investment and implementation in breastfeeding policies, systems, and environmental supports. According to the New York Times, the Resolution was expected to be approved quickly and easily by the hundreds of government delegates who gathered this spring in Geneva for the WHA. 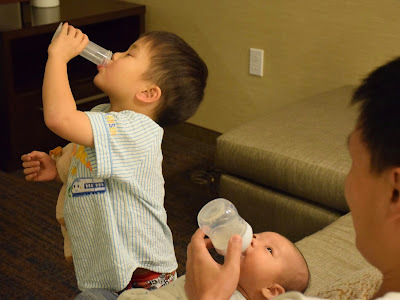 But the U.S. delegation specifically called for the removal of passages that called on Member States to restrict the promotion of artificial infant milk. The strong opposition to the Resolution by the U.S. stunned world health officials. My colleagues at San Diego County Breastfeeding Coalition (SDCBC) has joined breastfeeding organizations and advocates across the country and raised concerns about the role of industry in international policies and the aggressive tactics used by the U.S. delegation. We stand strongly for all families and fights for their well-being and believes that policies should always put babies before profits. Breastfeeding is the nutritional standard for infant and young child feeding as recognized by scientific evidence and health organizations worldwide. Decades of research on infant feeding has consistently proved critical short- and long-term health risks of not breastfeeding, as well as significant costs of artificial milk feeding. Breastfeeding builds a foundation for life-long health and wellness for mothers, babies, and all of society. It is considered a global maternal and child health imperative. Countries should strive to limit the inaccurate or misleading marketing of breastmilk substitutes. It is critical that international, national, and state policies work to protect, promote, and support breastfeeding so that every family who chooses to breastfeed has the opportunity to succeed. It is unfortunate that in the U.S. and World wide, barriers to breastfeeding success are widespread. The U.S. Breastfeeding Committee (USBC) is calling organizations to sign a letter and ask Department of Health and Human Services and Department of Commerce to support WHA Resolution on Infant and Child Feeding. Meanwhile, MomsRising is calling individuals to sign a petition and ask the formula companies to put the health and well-being of moms and babies above corporate profits. It’s always the right time to put babies before profits. Please join the movement and call upon our government to ensure that policy decisions and actions are based on current scientific evidence, free from industry influence, and carried out in accordance to global trade agreements and international law.